ICV Live webcasting was chosen to produce a series of online educator training webcasts for the ACSD, (formerly the Association for Supervision and Curriculum Development). Using a "Hub and Spoke" arrangement where one central "Hub" location is leading a live seminar with multiple geographically diverse "Spokes"attending via live webcast, the result was an unqualified success. The ACSD wanted to up the quality and flexibility of their collaborative online educator training processes. 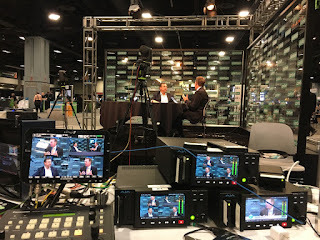 Moving away from the old WebEx and Adobe Connect model they had tried unsuccessfully, The ACSD chose ICV's Media Portal webcasting platform for its highly interactive, personalized yet flexible HD streaming Video webcasting solution. With a single point of contact and management ICVs full service offering was the first choice for ACSD's growing online training services. ICV provides not only the webcasting solution but the production services, and web based assets including hosting and the video player / media portal. With this initial webcasting success, a series of events and seminars are now being scheduled with ICV by ACSD. Diverse locations are not a problem for the webcasting veterans at ICV Digital Media, inc,. Employing full time webcast technicians, web developers and HD video producers and editors across the country and in europe, ICV has years of experience producing live webcasts as well as development of online web applications for webcasting, streaming media management and delivery. ICV can be found webcasting from locations around the world, including Asia, Europe, South America and across the United States.